Made up of 8 sheets. This article is about Charcoal. For Mineral Coal, see Coal. The Charcoal Pit is constructed by creating a covered structure of Log Piles and lighting it with a dropped (Default: Q) torch. Note: Only full log piles can have another log pile placed on top of them, so plan the height accordingly. The smallest version of a charcoal pit is a log pile with four logs inside to guarantee at least a single piece of charcoal produced. The Charcoal pit needs to be covered on all sides to allow it to burn without access to air. If any of the log piles are touching an air block, the whole structure will go up in flames. The Player will have roughly 10 seconds after dropping the torch before the pit catches fire. Once it catches fire the pit must be covered over with any non flammable solid block. Any exposed log piles will burst into flames and eventually drop their logs, causing the pit ignition to fail. If ignition was successful, smoke particles will be emitted from the covered pit. After 18 in-game hours, the smoke particles will dissipate and the log piles will turn into charcoal blocks on the floor of the pit, which can be harvested one sheet at a time with a shovel. 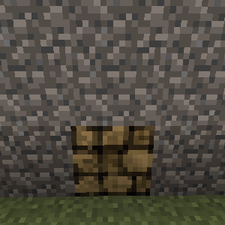 If the pit was covered with a gravity affected block such as dirt or cobble, these blocks will collapse into any of the air pockets created from the logs turning to charcoal. Most larger pits are made out of Stone/Brick to give a more permanent structure. Even with the increase of size and shape options for a charcoal pit, the following example is still the most commonly used design by veteran players for nostalgic reasons. Note: There is no optimal size or shape of charcoal pit to maximize efficiency, and it does not matter what type of logs the pit is built with. The more logs put into the pit, the more charcoal will be produced, with a ratio ranging from roughly 4:1 to 2:1 for logs:charcoal. First dig a 5x5 area minus the corners, and fill it in with log piles. Next place a 3x3 cap over top of the first layer. 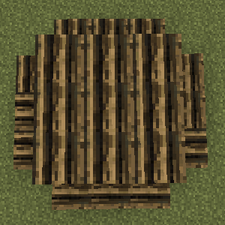 Note: The bottom layer log piles will have to be full in order to place more log piles on top of them. Cover the majority of the log piles with blocks, leaving access to one log pile to drop a torch on. Drop a torch onto the exposed log pile and wait for it to catch fire. It is highly recommended that the player doesn't light the log pile until the charcoal pit is nearly covered as the player will only have 10 seconds to finish the structure once the log pile has been lit. 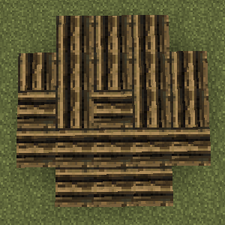 Charcoal can be placed as sheets by right clicking while sneaking, with 8 sheets forming a single Charcoal Block. To remove the placed Charcoal, the sheets must be dug up with a Shovel. A full charcoal block (8 sheets) surrounded on all sides but the top with Raw Stone, Smooth Stone, Stone Bricks or Cobblestone can be lit with a Firestarter or a Flint & Steel to produce a Forge. 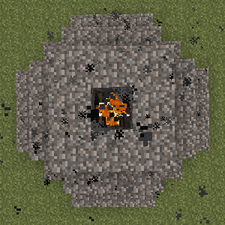 Charcoal is the main fuel in TFCraft. It is used in Forges, Bloomeries, and Blast Furnaces. Charcoal is also an ingredient in crafting Gunpowder. Removed charcoal production from burning logs in a fire pit. Added new charcoal pit multi-block structure. Finished charcoal is found inside the fire pit. 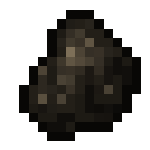 Bloomeries use up charcoal at the same rate as the ore smelts. Implemented charcoal pits of varying shapes and sizes up to 25m wide and 13m tall. Charcoal items are spit out into the world and the fire pit disappears upon completion. Completed charcoal pits create charcoal blocks, with each block containing up to 8 charcoal. Block must be harvested repeatedly with a shovel to obtain all of the charcoal. 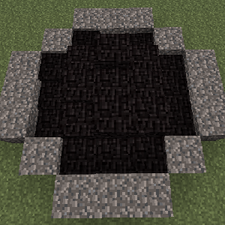 Charcoal may be placed on the ground to create new charcoal blocks or to fill existing blocks. Implemented creation of forge via lighting of charcoal block. Charcoal can no longer be thrown and lit to create a forge. Bloomery requires a primer block of charcoal at the bottom of the stack. Bloomery requires an equal or greater amount of charcoal than ore be thrown into the stack before it can be lit. Firepits are no longer needed for the creation of charcoal, instead a dropped torch ignites the log piles. 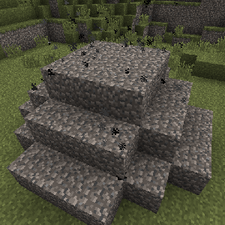 Charcoal pits can no longer be covered with flammable blocks. Log piles burn twice as slow to give players a bit more time to save their burning charcoal pits. Charcoal sheets are affected by gravity, and will merge into the charcoal block below it if the lower block contains less than 8 sheets. 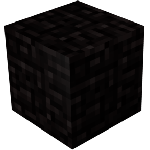 Because of this, the player can simply use a shovel on the lowest block to harvest an entire pillar of charcoal. A cross-section of the smallest charcoal pit possible. The start of a nostalgic charcoal pit. Lighting the pit with the majority of log piles already covered. This page was last modified on 10 July 2015, at 03:38.